Beanpole Ivory Coast striker Lacina Traore has agreed to join high-flying Everton on loan from Monaco for the remainder of the season. "The forward will require a visa before playing for the Toffees, a formality that is expected to be completed in the coming days," the English Premier League club said on their website on Friday. "He will then head to Merseyside until the conclusion of the 2013-14 campaign." 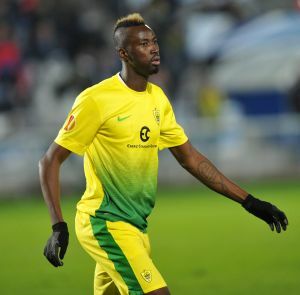 The 6-foot-8 Traore moved to big-spending Ligue 1 team Monaco on a four-and-a-half year deal from Russians Anzhi Makhachkala earlier this month. The 23-year-old scored 12 goals in 24 games last season after joining Anzhi from Kuban Krasnodar in June 2012. Traore, who has netted four times in seven internationals, was in the Ivory Coast squad beaten in last year's African Nations Cup quarter-finals by eventual winners Nigeria. He joins fellow countryman Arouna Kone at Everton who occupy sixth position in the league and visit third-tier Stevenage in the fourth round of the FA Cup on Saturday.